CASTING A SMOOTH AND ripple-free loop is an integral part of performance fly casting. However, even an experi­enced caster can instinctively tighten up under pressure to increase distance, speed up the delivery, or make a particu­larly difficult presentation. The result of this tension, more often than not, is an inefficient cast. Ideally, proficient casting should look effortless, with neat loops and a smooth line at all distances; however, some fly fishers appear to strain whenever they make a cast. Relaxed casting not only is more efficient, but also involves considerably less work than a more tense style. Fly fishers who seem to work the hardest probably do—and they get tired in the process. Outside of good casting mechanics, a relaxed stroke may be the most crucial factor in developing an efficient stroke. Relaxing doesn’t imply that effort is not exerted, only that the cast appears effortless. Even some otherwise fundamentally sound casters could improve their strokes by learning to relax at the right times. Tense and rigid muscles are not conducive to fluid movement and the top performance of any sports skill— including fly casting. To stay relaxed, many great hitters in baseball move their fingers almost continuously on the bat while awaiting a pitch. Some grip the bat so loosely that it may occasionally slip out of their hands as they take a swing. Similarly, professional golfers are not rigid while addressing the ball, nor do they hold the club with a white-knuckle grip. Both golfers and baseball players rely on a relaxed, smooth, and fundamentally sound swing while avoiding the futile urge to “kill” the ball—a move that usu­ally yields poor results. Similarly, the desire to be forceful with the rod usually ends badly. Furthermore, tight muscles can lead to cramping and fatigue. Although the entire body should remain relatively loose and at ease during the cast, the most important areas to focus on are the casting hand and arm. A white-knuckle “death” grip or excessively tight arm and shoulder muscles are detrimental to a smooth line, because they cause the rod to recoil and oscillate significantly after the stop at the end of both the forward and back strokes. 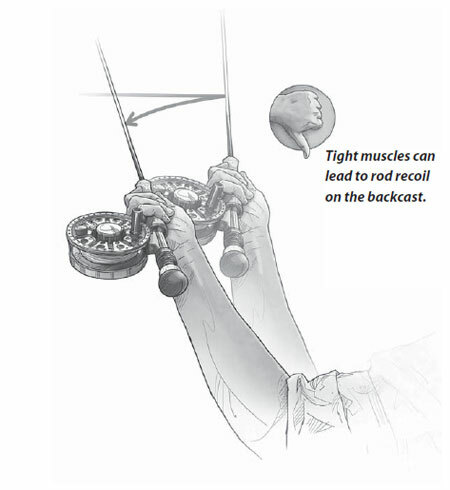 That tightness and the associated recoil occur most often when trying to over­power the rod in order to achieve extra distance, make a good stop, and speed up the delivery. Trying to cast a long line with a compact stroke instead of a more appropriate lengthier motion can have the same effect as well. The recoil creates an inefficient loop with shock waves of unde­sirable slack in the line that are difficult to manage. To reduce recoil so that the rod dampens or stabilizes for a smooth cast, your grip should be firm but not exces­sively tight throughout the acceleration-and-speedup seg ­ment of the casting stroke. Then, immediately after the stop, loosen the grip significantly and allow the rod to drift slightly with the line as the loop unfolds. The combination of loosened grip and drifting rod will immediately dampen the rod for a more effective stop so that the line flows smoothly through the air. You can then reestablish a firm grip each time you begin another stroke. Alternating the grip from firm to loose will substantially reduce recoil and keep the line free of any shock waves in the process. Sometimes stiff arm muscles go hand in hand with a white-knuckle grip. Simply relaxing the casting arm along with the hand after the stop will further help dampen the rod for a smoother motion. You can easily detect recoil by watching the line, rod tip, and rod hand after the stop at the end of each stroke. 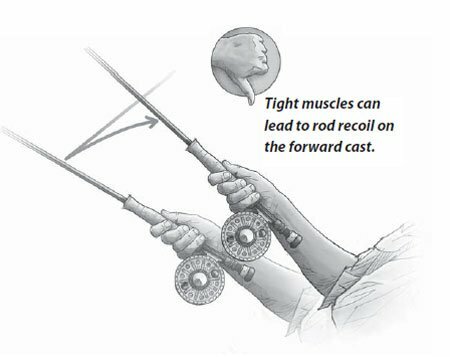 A wavy line, substantial rod-tip oscillation, and casting hand recoil indicate an excessively tight grip on the rod, muscle rigidity in the arm, or both. That same rigidity and tension can also cause you to yank the rod to a violent stop instead of fluidly accelerating to a relaxed stop. Yanking occurs most frequently on the pickup, and in the worst instances, the casting hand and arm recoil so severely that the entire rod immediately snaps back to an almost vertical position. Situations can develop quickly on the water, and you may often feel pressured to hurriedly make a presentation. Although it’s important to concentrate on the fish, part of your focus must remain on smoothly loading the rod for a more relaxed, but still prompt, delivery. Tight loops, a fluid line, and increased distance become easier to achieve as well. Just don’t relax so much that the rod and reel acciden­tally slip out of your hand in the process. Excerpted from Jon Cave’s Performance Fly Casting (Headwater/Stackpole Books, August 2011, softcover). Purchase in the MidCurrent Store.